The hour long session will take place from 11:00hrs PST; 14:00hrs EST; 19:00hrs GMT or 20:00hrs CET on 15 December. 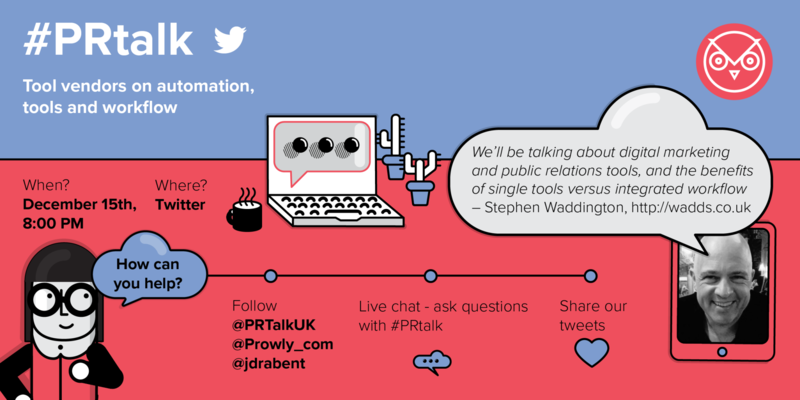 Prowly – an online platform designed to help public relations professional to streamline their media relations efforts. AirPR Analyst – an analytics, insights, and measurement platform for public relations practitioners to increase their effectiveness, and map public relations activities to business objectives. coveragebook.com – automates press reports by taking coverage screen-shots and pulling in traffic, social and domain authority data. It builds coverage books in seconds and presents in a customisable format that’s easy to share. Iris – helps public relations practitioners prove the value of their most important relationships – with journalists and influencers. We’re about the art and science of targeted media relations. MyNewsdesk – used by public relations professionals, brand publishers, journalists and bloggers to share their stories. Lissted – discover the truly influential voices in a community and the content, conversations and websites that matter to them. Prezly – relationship management tool for public relation professionals that aims to increase your impact. It offers you a full public relations toolkit. Traackr – an all-in-one solution to structure and scale company-wide influencer programmes. For more information visit Stephen’s blogpost.